An aerial photo of the 24.3 acre Cooper Academy site on North Mial Street in Clayton. 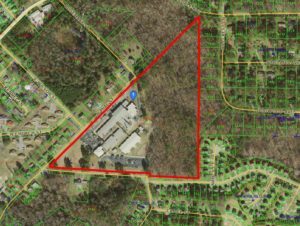 The Johnston County Board of Education plans to sell about one-fourth of the land they own on North Mial Street in Clayton, which is the home to Cooper Academy. The school is located on a 24.3 acre tract. The school board was recently approached by a developer about selling some of the unused wooded area at the school site. A total of 6.17 acres was identified that could be sold without causing any problems to the operation of the public school. Under state law, the school board must first offer the land to the Johnston County Board of Commissioners. Monday night, commissioners voted unanimously not to buy the 6 acre tract. School board attorney Jimmy Lawrence will now move forward with selling the property at a negotiated private sale. The fair market value of the property is $26,000 per acre or $160,420. Lawrence said he is researching how the school system first acquired the land but believes it was originally gifted to the school board. Officials said the land is no longer needed for school purposes and has never been used for school purposes with the exception of nature trails on the property. The name of the interested party was not disclosed.